The two South Florida women are among the more than 1,100 who joined the Women Airforce Service Pilots, or WASP, from 1942 to 1943 during World War II. Their primary mission: to protect U.S. coasts, freeing up America's men to fight in combat missions abroad. This wasn't make-work. It was deadly. Thirty-eight women pilots died in service to their country. Fleisher, who tested AT-6 warbirds, recalls losing ''a couple of buddies who were in my class'' in plane crashes. Yet these patriotic women's contributions went largely unrecognized for decades. They weren't even eligible for U.S. veterans' status until 1977. They were never awarded full military status nor eligible for officer status during the war. The women's selflessness was finally honored Wednesday when President Barack Obama signed a law awarding the Congressional Gold Medal to about 300 WASPs still living, mostly in their 80s -- and to the families whose mothers, aunts and sisters didn't live long enough to have their service acknowledged. ''It's wonderful that they're doing this after all these years,'' Sargent said. WASPs logged 60 million miles flying missions from coast to coast. They were to new generations of women what the Tuskegee Airmen, who exhibited their skill and courage during World War II, have been to African Americans. Both Fleisher, 87, and Sargent, 89, went on to serve in the Air Force reserves. Both moved to South Florida about four decades ago, married and were widowed. Fleisher never had children; Sargent has two sons and a daughter in Florida. Time and distance has muddled some of their memories, but Fleisher and Sargent haven't forgotten the pride they felt. After all, this was a time when women were expected to stay home and have babies. Career opportunities were narrowly defined: mostly, as secretaries, nurses and teachers. ''Damn impressive,'' Fleisher chuckled when asked about the WASP's work during the war. Fleisher has flying in her blood. She grew up in Rochester, N.Y., where her father was a pilot who later managed an airport. After the war, she would get a commission as a second lieutenant in the Air Force and retired in the reserves as a major. She met her husband, Maurice T. Fleisher, an Air Force major, in Philadelphia, where she worked in the control tower and he was a reserve pilot. Today Fleisher manages an avocado grove on her three acres near Homestead. She still drives her car and shares stories with a ''nice neighbor,'' a younger woman who retired as an Air Force colonel. Sargent, who keeps busy in a retirement community in Cutler Bay, spent 30 years at Miami-Dade Community College, speaking to students about her pilot years and the war. Maj. Gina "Torch" Sabric, an F-16 fighter pilot and 332nd Air Expeditionary Wing flight-safety officer, sits on her aircraft after a flight. Sabric proudly attributes the progression of women in aviation to the Women Air Force Service Pilots (WASP). President Barack Obama presented the WASP the Congressional Gold Medal, the highest and most distinguished award Congress can award a civilian, July 1. Courtesy photo, 332nd Air Expeditionary Wing. BALAD — It's been more than 60 years since the Women Air Force Service Pilots (WASP) took the skies by storm as the first women in U.S. history trained to fly American military aircraft, overcoming inequality and changing the face of aviation forever. July 1, these aviation pioneers were recognized by President Barack Obama, who presented the Congressional Gold Medal as long-overdue recognition of the historical "Fly Girls." Here at Joint Base Balad, a 21st-century "Fly Girl," Maj. Gina Sabric, an F-16 fighter pilot, couldn't be more pleased with the recognition. "I think it is amazing that they were presented [with the Congressional Gold Medal]," said Sabric, currently deployed here as the 332nd Air Expeditionary Wing flight safety officer from Nellis Air Force Base, Nev. "It is definitely well-deserved and probably a little overdue, but it is amazing that they are finally being recognized for their service to our country. "They are definitely pioneers in aviation and an inspiration to those of us that fly now," she continued. "We would not be here if it wasn't for the work that they did before us. They paved the way and opened up doors for the rest of us." The WASP was established during World War II with the primary mission of flying non-combat military missions in the United States, thus freeing their male counterparts for combat missions overseas. They were the first women ever to fly American military aircraft, and they flew almost every type of aircraft operated by the Army Air Force during World War II -- logging more than 60 million miles. Overall, more than 1,000 women joined the WASP and 38 of them were killed during duty. Following World War II, these women were released from duty and returned home. During their time in the WASP, they held civilian status and were not considered members of the military. Their contributions went largely unrecognized and the women weren't afforded veteran status until 1977. Today, female fighter pilots continue adding to the proud WASP legacy -- engaged around the world and writing aviation history of their own. 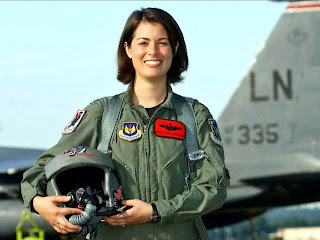 Although they did not have to face the same type of discrimination, even in the early 90s when Congress authorized women to be fighter pilots and when Sabric joined the Air Force, the rift between the female and male fighter pilots was still evident. "When I was a lieutenant, there weren't a lot of females ahead of us," said Sabric. "I was told a few times that I didn't belong and it was a 'boy's club' and girls were not welcome, but you would just shrug it off and go on doing your job. You don't see that anymore; we are all equal. Gender is no longer an issue thanks to these women. "Women in aviation has definitely been a stepping-stone progression, one that the WASP started," said Sabric. "Without them, it would have been a longer, tougher road. They set the stage for the rest of us to be able to continue what they started." The Congressional Gold Medal is the highest and most distinguished award Congress can award a civilian. Since the American Revolution, Congress has commissioned gold medals as its highest expression of national appreciation for distinguished achievements and contributions. In 2000 and 2006, Congress awarded the Gold Medal to the Navajo Code Talkers and the Tuskegee Airmen, respectively. "As a female pilot, the women of the WASP are our heroes," said Sabric, from Tobyhanna, Pa. "They are who we look up to. They are the pioneers. Looking back on what these women have accomplished, it's great to see them recognized. We are forever grateful." 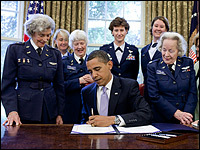 NPR SPECIAL on the WASP "ALL THINGS CONSIDERED"
All Things Considered, July 4, 2009 · President Obama signed a bill Wednesday granting the Congressional Gold Medal to a group of women most Americans have never heard of: the Women Airforce Service Pilots, or WASP. But even though they wore uniforms and worked on bases, they were never considered members of the military. Their contribution to the war effort was so controversial, in fact, that all records pertaining to their service were sealed and deemed classified in 1944. That pretty much consigned the WASP to the dustbin of history for decades. One of the WASP, Deanie Parrish, started an organization called "Wings Across America" (actually--her daughter, Nancy did) to document the story. For the past 10 years, she and her daughter Nancy have led the effort to get a Congressional Gold Medal for the women. But it wasn't until a young female fighter pilot in today's Air Force championed their cause that the bill became a reality. Guy Raz talked to the two pilots, each a groundbreaker in her own right. She tucks a tiny white curl back into her once-a-week hairdo, folds her hands just so and tells of her adventures during World War II. "We did maneuvers on the new planes when they first rolled them out of the factory. We made sure they worked right before they went into the war," said Marjorie Ellfeldt Rees, 87. "We put them through loops and chandelles — that's a steep incline and you bank it just before it stalls." Her hand becomes a tiny airplane, swooshing in the air. "We did spins, too. On a spin you take it until it does stall," she said. She giggles, and for a second she is 22 again, graduating from cadet school in 1944 as one of the first women trained to fly American military aircraft. This week, President Obama signed a bill honoring Rees, of Prairie Village, and the other female pilots who flew for the military between 1942 and 1944. They were known as Women Airforce Service Pilots, or WASPs. The surviving WASPs soon will receive Congressional Gold Medals in a ceremony in Washington — about a generation overdue, supporters say. Rees and her sister pilots flew every type of airplane that male pilots flew, doing the same jobs, with one big exception — they were forbidden from flying combat missions. But their flying was still dangerous. The WASPs flew airplanes that had never flown before. They also flew old, worn planes. They flew planes towing targets on steel cables so that male gunners could practice with live rounds — sometimes accidentally riddling their planes with bullets. "We took over every domestic flying job there was.... Some men didn't like that," Rees said. Rees fell in love with flying before she graduated from the University of Kansas City. Her boyfriend was a pilot, and so was his mother. When she graduated in 1942, her grandfather gave her $1,000. Rees used it all to buy 100 hours of flight lessons at the old Kansas City Municipal Airport. Her uncle saw a newspaper article that said the military was searching for female pilots. He gave the telephone number to his niece. But because she weighed only 100 pounds — the minimum was 108 — it took her two tries to pass the physical. For her second weigh-in, she hid fishing sinkers in her hair, her bobby socks and her bra. Even with all that lead, she made it by only half a pound. After a long bus ride to Texas (the first time this only child had been away from home) and six months of cadet school, she earned her wings. Of the 25,000 women who applied to become WASPs, 1,800 were accepted into the program, and 1,074 graduated. But after the war, the WASPs were grounded, their service largely forgotten. Thirty-eight of the women died while flying. They received no military honors — they were civilians working for the military. Their mothers weren't allowed to display gold stars, nor were they allowed to drape a flag on their caskets. Their families had to pay to get their bodies home. The government locked away records of the WASPs' service because the war was still going on. Rees went back to Kansas City, married, raised a family, worked, volunteered and returned to school to earn a master's degree and a doctorate. She is still active, competing in ballroom dance competitions. But she never flew an airplane again. In the 1970s, the government decided to allow women to enter U.S. service academies. The Air Force Academy announced that its new female cadets would become the first women to fly military aircraft. "They were just wrong," says Nancy Parrish, a documentary producer and the daughter of a WASP. Parrish and other women lobbied Congress to declassify the WASP documents, and they found WASPs to testify. "It wasn't so much about money or the GI Bill. It was about setting the record straight for these women," Parrish said from her home in Waco, Texas. She founded Wings Across America in 1996. The group's Web site documents WASP stories with interviews, photos, timelines and anything else Parrish can find. "History forgot about them because historians didn't know about them," she said. WASPs now are eligible for veterans' benefits. But fewer than 300 of them are still alive. Rees has mixed feelings about being honored now. "It's a sad thing, sort of, because other WASPs who aren't alive. I wish they could have done something sooner," she said. But, she added, she and her fellow WASPs are thrilled it's finally happening. "We didn't resent that we were ignored so long. We've thought for years how very lucky we were to fly those wonderful airplanes," she said. "... I want people to know that women can fly like the men." Ninety-six-year-old June Bent had to wait nearly 70 years to be recognized for her contribution to her country's defense during wartime. 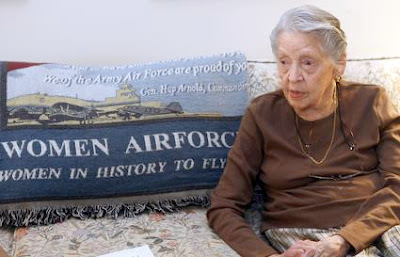 Bent, who lives at The Willows of Westborough, was one of the first 1,047 women to fly aircraft for the military as a member of Women Air Force Service Pilots, or WASPs. They ferried combat aircraft, including bombers and fighters, from factories to embarkation points around the country. They also flew in training missions. On July 1, President Barack Obama signed into law a bill awarding Bent and other WASPs the Congressional Gold Medal. Though they were technically considered civilian pilots, Bent said their training was as harrowing as their male counterparts. Even a routine mission could pose problems, Bent recalled. "We were flying through Texas and it was a beautiful night, the stars were all out," she said of one such time. "All of a sudden my windscreen was covered in oil, so I had to land with my head stuck out the side of the canopy." The bill lauds the valor of the all-female regiment. "The Women Air Force Service Pilots courageously answered their country's call in a time of need while blazing a trail for the brave women who have given and continue to give so much in service to this nation since," said Obama. Bent, who did not attend the ceremony, was pleased with the honor and thinks it is deserved. "I'm glad it happened, and I understand why it did," she said. Their numbers are growing smaller. "There are only about 400 of us still around," she said. 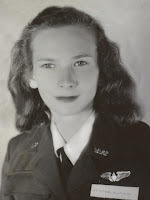 Despite her role as a woman in the military, Bent was careful to explain that she and her female compatriots were considered to be civilians throughout World War II, and were not recognized as military personnel until 1977. "Some of us were saluted like the rest of the people in uniforms," she said, though this treatment varied depending on where the WASPs were stationed. The Congressional Gold Medal comes 60 years after the fact, and stands in stark contrast to how the women performed a mostly thankless job. "WASP started in 1942 and disbanded on Dec. 20, 1944, when they didn't need us anymore. They didn't even pay our way home," Bent said. Bent attributes much of the success of the pilots to the progressive women who strove to prove themselves, especially Jacqueline Cochran, the founder and director of the WASPs. "She was a tough cookie," Bent said. "She thought women could be taught to fly just like men." During her service, Bent also tested planes used by cadets to see if anything was wrong with the aircrafts. Challenges were not the only thing Bent encountered during her time in the military - she also met her husband, a fellow pilot. "He came up at lunch with his tray and said, 'Can I sit here?' Two-and-a-half months later we were married," she said. John "Jack" Bent, an avid photographer who worked for the Eastman Kodak Company following his military service, died in 2005. Bent believes that the biggest accomplishment of the WASPs was to demonstrate that women could serve their country. "We proved that women could fly as well as men," she said. Bent felt that the WASPs' lessons could be instructive to today's women as well. "I'm 96 years old. I'm bound to say something that matters," she said. It may have been 60 years overdue, but last week President Barack Obama bestowed the nation’s highest civilian honor on the courageous and long overlooked Women Airforce Service Pilots. Unfortunately, most of the women who flew U.S. military aircraft for the first time during World War II aren’t around anymore. “The WASPs are dropping like flies. There were only about 1,000 of us to begin with and I think there are only 300 of us left,” said Elizabeth “Betty” Pfister in an interview at her Aspen home this week. Pfister, 88, and another Aspen resident, Ruth Brown, 88, are both receiving the congressional gold medal for their admirable service. Now that Obama has signed the measure into law, a medal ceremony will soon be scheduled in the nation’s capital to honor the WASPs. But for decades, the women were left out of the history books. The Women Airforce Service Pilots, or WASPs, formed in 1942 to answer the call of the military’s aviation need in the United States, freeing up male war pilots to do battle overseas. After 16 months, the program was shut down at the end of 1944 with zero recognition from the government. After the war ended, the women went back to their daily lives without receiving any of the support given to men in the military. The WASP records were sealed for more than 30 years until, in 1977, Congress elected to make WASPs eligible for veterans benefits. The women did not perform in combat but they were assigned to military bases where they flew drones, transported cargo, served as instructors, conducted night exercises, tested repaired aircraft, and other dangerous duties. Thirty-eight women were killed carrying out their work. Pfister, whose brother was a navy pilot who was killed when he was 21, already knew how to fly — and she was quite good at it. “I loved to fly, the war was on and it was a good combination,” she said. She and Brown were two of the 25,000 women who applied for the WASP program. Fewer than 1,900 were accepted and only 1,074 completed the grueling training program at Avenger Field in Texas. Pfister joined the ferrying division, transporting planes from one place to another, and testing repaired planes damaged in combat. “We would test fly them and it was just a miracle if anything worked. We were expendable and the men were not,” said Pfister, whose division had a lower accident rate than their male counterparts. Despite the tough assignments, Pfister said she had a lot of fun. Brown learned how to fly in Denver so she could apply to become a WASP. Once enlisted, she flew planes for cadets to practice their bombardier training using a new instrument at the time, the Norden bomb sight, which allowed pilots to better zero in on targets. 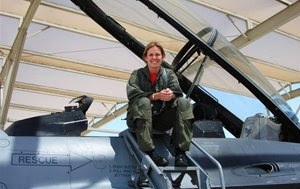 Pfister, who has been named one of the 100 most influential women in the history of aviation, said she hopes to attend the medal ceremony in Washington, D.C., once its time and location are announced. “I’m still vertical. I’m still able to travel at this point,” she said. Betty Pfister, 88, at her home in Aspen. Plano resident Frankie Bretherick received a long overdue recognition July 6 for her service during World War II. “Plano has a living legend among us in Frankie Bretherick. To the brave and selfless women like Frankie, our nation owes them a debt of gratitude for their service and sacrifice,” said Rep. Sam Johnson. 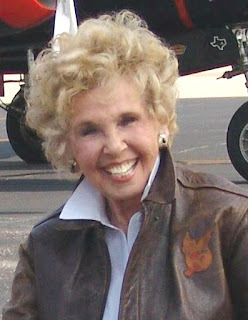 Johnson presented the World War II female pilot with a Congressional Record heralding her service and congratulating her for earning the Congressional Gold Medal. 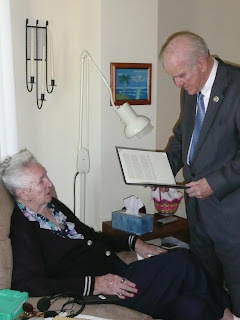 Johnson visited Bretherick’s home and thanked her for her service and bravery. Bretherick’s niece, Linda Cosper of Plano, and a few friends and family also attended the private meeting with Johnson. “As a fighter pilot in the Air Force for 29 years, I hold the WASPs in high regard. All veterans share a common bond of service before self. I have profound respect for brave women, like Frankie, who put their lives and dreams on hold to serve their country. The WASPs contributed to America’s victory in World War II, no doubt about it,” Johnson said. The Women Air Force Service Pilots (WASP) of World War II recently received recognition from a bill President Obama signed into law. It gave the WASPs the Congressional Gold Medal, the nation’s highest civilian commendation. The WASPs flew and ferried American planes, in turn freeing up American men to fly the combat missions. “It’s long past time these dynamic women had their time in the spotlight. I hope that they savor every second of it. While long overdue, I’m thankful that the WASPs will finally receive the Congressional Gold Medal for their contribution to America’s WWII victory,” Johnson said. Bretherick is one of only 300 living WASPs. During the war there were 1,102 WASP pilots. The WASPs were the first women in American history to fly military aircraft. From 1942-1944, women were recruited to fly non-combat missions, so that every male pilot could be deployed in combat. These women piloted every kind of military aircraft and logged 60 million miles flying missions across the United States. The WASPs were never awarded full military status and were not eligible for officer status. In 1977, they were granted veterans’ status. The Congressional Gold Medals will be awarded to all 1,102 pilots and/or their surviving family members. Bretherick was born on Sept. 19, 1914, in Cranfills Gap, which is about three hours southwest of Plano. She graduated from Providence Hospital Nursing School in Waco in 1937. After graduation, she worked for five years at various veterans’ hospitals in Texas and Louisiana. She began flying lessons at an airport south of Dallas. 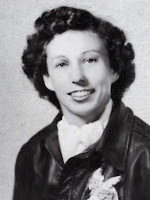 When Bretherick applied and was accepted into the WASP program, Class of 44-W-6, she had a commercial pilot's license and had logged more than 200 hours of flying time. She flew BT-13s and UC-78s and slow-timed repaired aircraft at the Greenville Army Air Base. Bretherick was deactivated on Dec. 20, 1944, and was subsequently asked to join the Army Nurse Corps in May 1945. She worked at a hospital in Mitchell Field, N.Y. for three weeks. 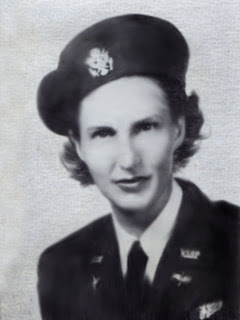 She was then sent to Randolph Field in San Antonio to attend the School of Aviation Medicine where she received training to become an air evacuation nurse. After the war she attended Southern Methodist University and studied business. She also worked part-time as a nurse while in school. Bretherick met her husband, Joseph, while the two were stationed in Greenville, Miss. The Brethericks were married in 1949. Her husband died in 1999. She moved to Plano about three years ago. Contact Heather Smith at HSmith@acnpapers.com.